The customer is king at CEWE, which handles unique orders. The European market leader in the photo service segment relies on the Vareo perfect binder to achieve the high production quality that the market demands. 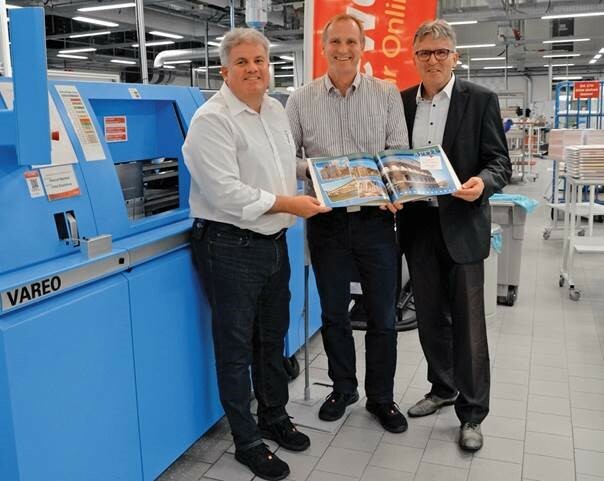 The over 50 million photo books that have been sold since their launch in 2005 are the flagship product of the company, which has four sites in Germany, its home market. Customers mainly design the 21st century albums on their computer and order online. The Vareo plays a key role in the production process. The Muller Martini perfect binder at the company’s site in Eschbach near Freiburg im Breisgau can handle an equivalent volume to the company’s two previous perfect binders put together. The CEWE managers were so impressed with the commissioning of the Vareo that they have followed it up with a perfect binder of the same type at all their sites in Germany. From left to right: Gerd Wild (Digital Printing Manager), Michael Bühl (Technical Manager) and Peter Stein (Area Sales Manager at Muller Martini Germany) in front of the new Vareo at CEWE in Eschbach.